ALGECIRAS, Spain (Reuters) - Spanish rescue boat Open Arms arrived in the southern port of Algeciras on Thursday with 87 migrants the crew said they had rescued off the coast of Libya. The 87 people were rescued from an inflatable raft which was floating directionless with a broken motor in the open sea on August 2, Open Arms said. 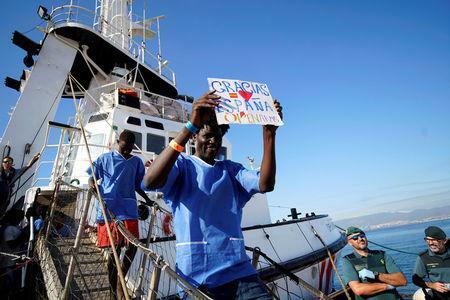 Those saved included 84 from Sudan, one Syrian, one Egyptian and a Gambian. There were 12 children included in those saved, the group said. "We came across the raft where the people were in a very bad state and very afraid that we were a Libyan boat and we planned to return them to Libya," Open Arms mission head Ricardo Gatti said during a news conference in Thursday. France will take in around 20 of the Open Arms passengers, a source in President Emmanuel Macron's Elysee palace said. A team from refugee office Ofpra will travel to Spain to identify those who will come to France, the source said. According to the U.N.'s International Organization for Migration, Spain has seen arrivals jump to 23,741 to August this year compared to just 8,677 in the same period in 2017 as countries such as Italy clamp down on arrivals along its coast.